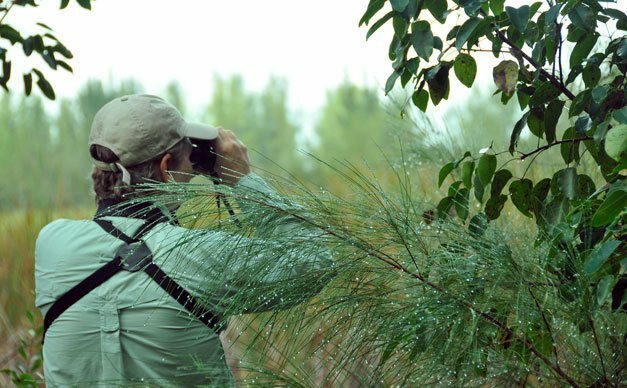 We all love a good binocular, especially one that will not cost us a fortune. I mean, how many of us are willing and able to spend more than $500 on a binocular? Not many I supposed. Thankfully, some of the best binoculars in the world cost less than $500. And in this article, I will be comparing two of the best binoculars in the world, the Nikon Monarch 5 and 7. Now I know the Nikon Monarch 5 vs 7 debate is not about to end anytime soon. And as such, I will not try and convince you that one is better than the other. Instead, I will highlight the strengths and weaknesses of each and let you decide which the better of the two is. Below you will learn the comparison between every possible size of Nikon Monarch 5 and 7. The Monarch 5 8X42 and Monarch 7 8X42 binoculars are very similar and there is very little that separates the two. For starters, both are roof prism binoculars with phase-corrected and high reflection mirror coated dielectric ED prisms. Therefore, both deliver the kind of sharp, clear images that we have come to expect from Nikon optics. However, when pitted against each other the Monarch 7 comes out on top in regards to image quality. This is thanks to the Monarch 7’s premium ED glass and proprietary lens coating. When it comes to weight and comfort though, the Nikon Monarch 5 8X42 emerges the victor. Its long eye relief of 19.5 mm is better than the 17.1 mm eye relief of its sibling. Furthermore, weighing 21.5 ounces it is one of the lightest full-sized binoculars around. Now, am not saying that the Monarch 7 8X42 is heavy. On the contrary, weighing 22.1 ounces it is also one of the lightest full-sized binocular on the market. What I am saying is that it is about an ounce heavier than its counterpart. Although both binoculars have a magnification of 8X and a 42 mm objective lens, the Monarch 7 has a wider field of view, which stands at 4​20 feet at 1000 yards. It also has a closer focus distance. While the Monarch 7 can focus on targets as close as 8.1m the Monarch 5 can focus on targets as close as 8.2 m with a field of view of 330 feet at 1000 yards. ​With regards to price, the Monarch 5 is considerably cheaper than the Monarch 7. Nevertheless, the Monarch 7 is still reasonably priced for a binocular with its features. The main competitor of both binoculars is the Vortex Diamondback 8X42. The latter is slightly cheaper than the Monarch 3 and offers a better field of view. Thus, when it comes to the Nikon Monarch 5 vs vortex diamondback the latter is the outright winner in regards to the field of view and price. However, this is not to say the Monarch 5 is a bad binocular. Quite the contrary, it is the ideal option for bird watching thanks to its lightweight construction and long eye relief. The Monarch 7 is more suited to other applications such as hunting thanks to its wider field of view and better optics. ​The 10X42 variations of the Nikon Monarch 5 and 7 improve on some of the features that made the 8X42 variation popular. 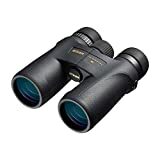 As their name suggests, both binoculars retain the 42 mm objective lens, which is paired with a 10X magnification, which translates to a narrower field of view. The Nikon Monarch 5 10X42 has a field of view of 288 feet at 1000 yards. On the Monarch 7, has a field of view of 351 feet at 1000 yards. Thus, when it comes to the field of view, the Monarch 7 is still the better of the two. ​Brightness and low light viewing are almost the same in both binoculars due to them having the same fully multicoated dielectric ED optics. The Monarch 7’s 8.2 feet close focus gives it an edge over other 10X binoculars, but not over the monarch 5. The latter has a close focus distance of 7.8 feet, which is quite impressive. ​Both binoculars have a rubberized exterior that comes in handy during rainy days. And with 64% of Americans needing glasses to see, it is nice to note that both have a long eye relief. All the same, the Monarch 5 has a better eye relief of 18.4 mm compared to the Monarch 7’s 16.4 mm. Also, the Monarch 5 weighs less than its brother and costs less. ​So, which is the better binocular, the Monarch 7 or monarch 5? Well, it is difficult to say precisely as there is very little separating the two. However, given that the Monarch 5 is cheaper I would have to go with the Monarch 5 10X42 as being the better binocular. The Nikon Monarch 5 10x42 best price is somewhere in the region of $270. Contrastingly, the Monarch 7’s best price ranges between $450 and $500. However, remember that this is my own personal opinion and you might have your own opinions on the matter, which are as valid as mine are. ​There are other variations of both the Nikon Monarch 5 and Nikon Monarch 7. Under the Nikon Monarch 5, we have the 8X56 and 12x42 variations. On the other hand, under the Nikon Monarch 7, we have the 10X30 and 8X30 variation. ​Of all the Monarch binoculars the 8x56 is one of the brightest due to it's 56 mm objective lens. Additionally, it has the largest objective lens. Unfortunately, it is also one of the heaviest and might not be suitable for backpacking or hiking. ​The10X30 and 8X30 variations of the Monarch 7. Needless to say, the two do not have the best field of view. At 117 feet at 1000 yards, the field of view of the 10X30 is far cry from that of the 8X42 and 10X42 variations. However, the 10X30 weighs considerably less than its counterparts. The 8X30 variation on its part has one of the best fields of view of 435 ft at 1000 yards. ​It is hard to tell which is better between Nikon Monarch 5 vs. Monarch 7 Binoculars as both binoculars have something offer. All the same, if you are looking for a lightweight and affordable binocular for backpacking or birdwatching the Monarch 5 will do. However, if you want a binocular for hunting the Monarch 7 is the ideal binocular. Generally speaking, Monarch 5 binoculars are cheaper than their Monarch 7 counterparts.